By looking at the films from a mechanical engineering perspective, as well as a biological one, the researchers showed that using water to penetrate the junction between biofilms and surfaces, coupled with gentle peeling, can result in immaculate removals. That outcome contrasts with traditionally ineffective methods of scraping or mechanically dislodging biofilms, which sometimes leave behind still-adhered patches that regrow and recontaminate. The new removal method should help in thwarting harmful biofilms, as well as controlling the beneficial biofilms increasingly relied on for waste water treatment, microbial fuel cells and other applications. "We have discovered an easy and effective way to remove nasty biofilms from a variety of surfaces," said Jing Yan, an associate research scholar working jointly in the Princeton labs of Howard Stone, the Donald R. Dixon '69 and Elizabeth W. Dixon Professor of Mechanical and Aerospace Engineering, and Bonnie Bassler, the Squibb Professor of Molecular Biology and Howard Hughes Medical Institute Investigator. "By investigating and defining the material properties of bacterial biofilms, rather than their biological properties, we have invented a new method for detaching entire biofilms," said study co-author Bassler. For their investigation, the Princeton researchers turned to the bacterium Vibrio cholerae, which forms biofilms in sea water, fresh water and in the human intestine. Measurements revealed that the biofilms it produces exhibit mechanical behaviors very similar to hydrogels, which are materials extensively studied in Stone's lab. Well-characterized, manipulatable hydrogels have many applications, especially in biomedicine, including wound dressing, drug delivery and tissue engineering. Biofilms and hydrogels are largely made of water (about 90 percent). They possess defined structural networks that make them soft, viscous and elastic. Their stretchiness has a limit, however. If disturbed too vigorously, biofilms and hydrogels will break into pieces. This fragility poses a challenge for biofilm removal. It also hinders the intentional transfer of beneficial films between surfaces, for instance in industrial settings, and when running experiments in the lab to study biofilms in the first place. To learn how to avoid such fragmentation, the Princeton team examined the attachment of the V. cholerae biofilms to a variety of surface types. The researchers saw that the edges of the biofilms were water repellant, while surfaces they adhered to were sometimes water-attractive. Based on this insight, the researchers sought to drive a wedge between the biofilm and attached surface by driving water into the space at which the materials meet. This technique, known as capillary peeling, successfully created a lengthening crack that culminated in full separation of the biofilm from the surface. The water-assisted peeling must go slowly to prevent biofilm tears—akin to carefully removing a sticker—but the results showed that the extra time was well worth it. "Our capillary peeling method worked astonishingly well," said Yan. One obstacle for deploying the method outside the lab is that many biofilms exist in already-aqueous environments, where capillary peeling would appear to be a nonstarter. For those cases, Yan and colleagues have proposed two potential solutions to explore in future research. For biofilms initially grown underwater, the film and its adhered-to object could be removed from solution and dried out before removal attempts. 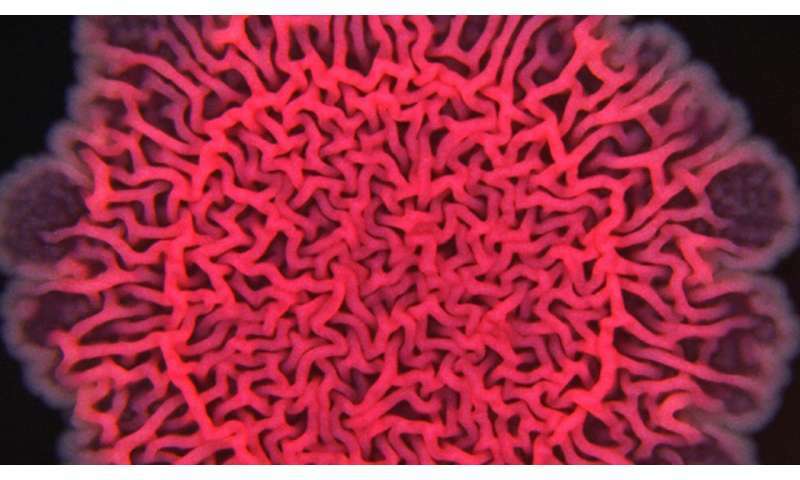 Alternatively, introducing bubbles to the biofilm-substrate interface might deliver the same sort of capillary force. "Led by Jing, the students and postdocs did amazing work in developing a detailed understanding of the link between the biological components and the macroscopic mechanical properties of biofilms," said Stone. "Our demonstration that biofilms can be peeled—intact—may prove useful in a multitude of ways going forward." After years of waging mechanical and chemical warfare on the persistent slime in and behind our laundry machine's soap dispenser, I must salute any progress, however small.